Like many composers before and since, Joseph Joachim Raff was faced with a stark choice: to fulfil an urgent desire to write music, or to make a living in order that he might survive and possibly enjoy the freedom to compose later. And, like others, he found the effort to combine the two ambitions a severe strain. If it had not been for a fortuitous event in 1845 he might have spent his days as an obscure music teacher. He was born on Wednesday 22 May 1822, near Zürich, into a family which had recently found refuge in Switzerland after fleeing from Württemberg where Raff's organist father had faced conscription into the French army. Funds were short. By the age of about eighteen Raff was composing piano music in his spare time, but he had to support himself with a routine teaching post. Some of his works came to the attention of Liszt. Impressed, Liszt was instrumental in getting them published by Breitkopf und Härtel in Leipzig in 1844, and the following year came the opportunity that brought Raff eventual fame. Liszt was to play in Basle and in order to see the great man, to hear him play and to thank him personally, Raff undertook the long walk from Zürich (some fifty miles)—a daunting journey even for a young man of twenty-three. He was rewarded generously, for the influential Liszt took to Raff and secured him a musical position, firstly in Cologne and later with Schuberth, the Hamburg music publishers. In these posts Raff gained experience and continued to compose for the piano. However, it was not as a composer that his next advance came, but as a live-in assistant to Liszt in Weimar in 1850. He endured it for six years, gratefully gaining more experience with the now world-renowned virtuoso composer, but Raff's own composing ambitions finally drove him to eut his ties and set himself up as teacher and composer in Wiesbaden. Now married, Raff met his new responsibilities with a flood of compositions and began to find real personal fame away from the benign but overwhelming shadow of Liszt. Raff's first opera, King Alfred, had been given in Weimar in 1851, and another, Dame Kobold, came in 1870, but other dramatic attempts found no outlet. His numerous contributions to the enormous repertoire of nineteenth-century piano music, however, were more successful, for much of it was aimed at the lucrative populär market of pieces for the salon. One of these survived the catastrophic decline of Raff's popularity after his death and he was long thought of, if at ali, as a one-work composer. Raff's Cavatina, like Dukas's The Sorcerer's Apprentice and Järnefelt's Praeludium, stood for years as the sole representative of its composer's output. Today his considérable worth is being realized as recordings, and even the occasionai concert and recital, are bringing into the open his Chamber works, songs, music for choir and concertos for the violin, cello and piano. Central to his orchestral music are four Shakespeare overtures and eleven symphonies, eight of them hearing subtitles reflecting literary or programmatic content. 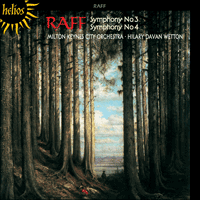 Titles such as 'To the Fatherland' (Symphony No I), 'Lenore' (No 5, based on a poem by Gottfried August Bürger), 'In the Alps' (Symphony No 7) and four Symphonies (Nos 8 to I I) related to the seasons of the year, contributed to the fame Raff enjoyed later in life. His last five years were spent as director of the Frankfurt Conservatory, in which post he died in June 1882, aged sixty. A fresh, open atmosphere is conveyed by the transparent scoring of this first movement: those are doubtless birds twittering and fluttering amongst the branches of this forest. Raff is faithful to established sonata form, content to offer his invigorating view of sylvan delights without allowing our concentraron to be distracted by 'progressive' formal elements. A similar mood is evoked in the Largo as evening approaches. The outer sections are notable for the affectionate duet of clarinet and horn while the darkening scene is skilfully conveyed by the writing for strings. Given the subject matter of the third,movement and Raff's milieu it is almost inevitable that the spirit of Mendelssohn should be conjured up in the Scherzo. In the Finale the dryads yield to encroaching night and to the hunters of the wild forest who take possession of the darkling scene in a blustering march which displays Raff's admirable control of sustained invention. There is a magical transition to the chorale-like coda as dawn once more floods through the forest. This Symphony carries no declared programme but some earnest subject was evidently in the composer's mind as the opening on cellos gradually expands, gaining in confidence and power. In the second group the swinging pulse is maintained but is set against a broken staccato rhythm which, when allocated to woodwind, suggests, for a fleeting moment, Elgar. The main thrust of this second group, however, is the folk-like melody heard on cellos, then oboe. First violins are put to the test in the contrapuntal development, a section that again speaks of serious matters, and the recapitulation reintroduces the earlier subjects in the same order, closing with a forceful coda. Once again Mendelssohn's feather-light music is recalled in the Scherzo but this is not to detract from the personality of Raff since Mendelssohn's influence in such a movement was extremely powerful throughout the nineteenth century, extending Europe-wide and virtually creating public demand that a scherzo should feature rapid string figuration and exquisite woodwind writing. For all that, Raff's own character still emerges intact. It is heard at its most winning in the Andante, whose solos for bassoon and oboe show a resourceful lyrical gift that is, as it were, challenged by the disruptive nature of the contrasting material. By some mysterious alchemy, these elements become complementary towards the end. A brief reference to the first movement opens the Finale before a change to G major introduces the dancing woodwind theme of the movement. Hilary Davan Wetton draws attention to the heavy demands made upon the violins in this Symphony, demands of particular severity as the Finale moves through several keys before returning to the tonic in a series of arresting string unisons. One last recollection of the first movement on horn is quickly despatched by a coda impatient to seal the Symphony in affirmative mood. Comme beaucoup de compositeurs avant et après lui, Joseph Joachim Raff était acculé à un choix difficile: ou bien réaliser son ardent désir d'écrire de la musique, ou bien gagner sa vie pour survivre et peut-être pouvoir un jour composer librement. Et, pour lui comme pour les autres, conjuguer ces deux ambitions, demandait un grand effort. S'il ne s'était pas produit un événement fortuit en 1845, il aurait pu demeurer, pendant toute sa vie, un professeur de musique inconnu. Il était né le mercredi 22 mai 1822, près de Zürich, dans une famille qui s'était récemment réfugiée en Suisse après s'être enfuie du Württemberg où le père de Raff, qui était organiste, était menacé de conscription dans l'armée française. L'argent manquait. À l'âge de dix huit ans, Raff composait de la musique pour le piano à ses moments de loisir, mais il devait gagner sa vie dans un poste routinier d'instituteur. Certaines de ses oeuvres attirèrent l'attention de Liszt. Ce dernier les apprécia et les fit publier par Breitkopf und Härtel à Leipzig en 1844; c'est l'année suivante que Raff rencontra la chance qui lui vaudrait sa célébrité future. Liszt devait jouer à Bâle et pour voir le grand homme, l'entendre jouer et le remercier en personne, Raff entreprit de s'y rendre à pied de Zürich (80km environ), aventure astreignante, même pour un jeune homme de 23 ans. Il en fut amplement récompensé car Liszt, qui avait de l'influence, se prit de sympathie pour Raff et lui trouva une situation, d'abord à Cologne, puis chez Schuberth, éditeur de musique à Hambourg. Dans ces postes, Raff acquit de l'expérience et continua à composer pour le piano. Ce n'est cependant pas comme compositeur qu'il obtint alors de l'avancement, mais comme assistant de Liszt, logé et nourri, à Weimar, en 1850. Il y resta pendant six ans, obtenant avec reconnaisance un surcroît d'expérience auprès du cömpositeur-virtuose qui était devenu célèbre, mais sa propre ambition de compositeur le poussa finalement à se libérer et à s'établir comme professeur et compositeur à Wiesbaden. Marié, Raff remplit ses nouvelles responsabilités grâce à un déluge de compositions et commença à connaître une véritable célébrité personnelle, en dehors de l'ombre protectrice, mais étouffante, de Liszt. Le premier opéra de Raff, Le Roi Alfred, avait été joué à Weimar en 1851, et un autre, Dame Kobold, fut présenté en 1870, mais ses autres efforts dramatiques ne furent pas acceptés. Cependant, ses nombreuses contributions à l'immense répertoire de musique pour le piano du XIXe siècle eurent davantage de succès, car elles s'adressaient, pour la plupart, à la clientèle lucrative et populaire des morceaux de salon. L'une d'elles a survécu au déclin catastrophique de la popularité de Raff après sa mort et on s'est longtemps souvenu de lui—si l'on s'en souvenait—comme du compositeur d'une seule oeuvre. La Cavatine de Raff, comme L'apprenti sorcier de Dukas et Praeludium de Järnefelt fut pendant des années le seul exemple connu de l'oeuvre de son compositeur. De nos jours, on commence à reconnaître son grand talent à mesure que les enregistrements, et même de temps en temps un concert ou un récital, révèlent ses oeuvres de musique de chambre, ses mélodies, sa musique pour choeurs et ses concertos pour violon, violoncelle et pour piano. Au coeur de sa musique orchestrale, on trouve quatre Ouvertures de Shakespeare et onze Symphonies, dont huit portent des sous-titres reflétant un contenu littéraire ou à programme. Des titres comme 'A la Patrie' (Symphonie nº I), 'Lenore' (nº 5, basée sur un poème de Gottfried August Bürger), 'Dans les Alpes' (Symphonie nº 7) et quatre Symphonies (Nos 8 à I I) associées aux saisons de l'année, ont contribué à la célébrité de Raff vers la fin de sa vie. Pendant ses cinq dernières années, il était Directeur du Conservatoire de Francfort et il mourut à ce poste, en juin 1882, âgé de soixante ans. Cet enregistrement présente deux Symphonies de ce qu'on pourrait appeler la 'période du milieu' de Raff: le nº 3 date de 1869 et le No 4 de deux ans plus tard. Pendant les années passées avec Liszt, il avait beaucoup appris sur l'art d'écrire avec effet pour l'orchestre. Il se vantait même parfois d'avoir 'mis de l'ordre' dans le Concerto symphonique de Liszt (c.à.d. le Concerto nº I pour piano) et, maintenant encore, le nom de Raff figure comme collaborateur orchestral en tête du poème symphonique Tasso. Cependant la musique de Raff doit plus à son admiration juvénile pour Mendelssohn et Schumann qu'à l'école néo-allemande de Liszt et Wagner. On peut aussi déceler l'influence de Beethoven: ces deux symphonies commencent par un rythme à trois temps, dans les profondeurs de l'orchestre, comme la Symphonie 'Héroïque', et la Symphonie nº 3 de Raff est dans la même clef que la 'Pastorale' de Beethoven. De plus, le titre du premier mouvement de Raff reflète ce que Beethoven disait de la sienne: 'davantage une expression de sentiment qu'une peinture'. L'orchestration transparente de son premier mouvement communique une atmosphère de plein air: ce sont certainement des oiseaux qui gazouillent et volètent à travers les branches de la forêt. Raff reste fidèle à la formule établie de la sonate, se contentant de nous offrir sa vision tonifiante des joies sylvestres sans distraire notre concentration par des éléments formels 'progressifs'. Le Largo évoque des impressions semblables, avec l'approche du soir. Les sections externes sont remarquables pour le duo affectueux de la clarinette et du cor tandis que le paysage qui s'assombrit est évoqué avec art par l'écriture des cordes. Etant donnés le sujet du troisième mouvement et les associations de Raff, il est presque inévitable que l'esprit de Mendelssohn soit invoqué dans le Scherzo. Dans le Finale, les Dryades cèdent à la nuit tombante et aux chasseurs de la forêt sauvage qui prennent possession de la scène obscure dans une marche fanfaronnante démontrant l'invention soutenue et admirablement contrôlée de Raff. Il y a une transition magique menant à la coda en forme de choral, avec le retour de l'aube qui inonde la forêt de lumière. Cette Symphonie ne comporte aucune indication de programme, mais le compositeur avait évidemment un sujet sérieux dans l'esprit pour l'ouverture des violoncelles qui s'élargit progressivement, de plus en plus assurée et puissante. Le deuxième groupe thématique maintient le battement entraînant, mais il l'oppose à un rythme staccato haché qui, lorsqu'il est repris par les bois, rappelle brièvement Elgar. Mais ce qui domine ce deuxième groupe, c'est la mélodie de genre folklorique, présentée par les violoncelles, puis les hautbois. Les premiers violons sont mis à l'épreuve avec le développement en contrepoint, section qui de nouveau évoque des idées sérieuses, et la récapitulation ramène les sujets précédents dans le même ordre, concluant avec une puissante coda. Là encore, il y a un rappel dans le Scherzo de la musique aérienne de Mendelssohn; mais cela n'enlève rien de l'originalité de Raff, car l'influence de Mendelssohn sur ce type de mouvement était très forte pendant tout le XIXe siècle, s'étendant à toute l'Europe et créant une véritable demande de la part du public pour des scherzos comprenant de rapides figurations de cordes et des passages ravissants pour les bois. Malgré cela, la personnalité de Raff se dégage dans son intégrité. On la retrouve avec tout son charme dans l'Andante, dont les solos de basson et de hautbois révèlent un don lyrique inventif, qui triomphe de l'interruption du matériel contrastant. Grâce à une alchimie mystérieuse, ces éléments opposés se complètent, vers la fin. Une brève allusion au premier mouvement ouvre le Finale, avant le passage à Sol majeur qui fait danser les bois pour leur entrée dans le thème du mouvement. Hilary Davan Wetton fait remarquer les grandes difficultés présentées aux violons dans cette Symphonie, particulièrement lorsque le Finale traverse plusieurs clefs avant de revenir à la tonique avec une série de saissisants passages de cordes à l'unisson. Un dernier rappel du premier mouvement au cor est rapidement éliminé par une coda impatiente de terminer la Symphonie sur un ton affirmatif. Wieviele Komponisten vor und nach ihm, sah sich auch Joseph Joachim Raff vor die krasse Wahl gestellt, seinem Drang zu komponieren nachzugeben oder seinen Lebensunterhalt auf eine Weise zu verdienen, die ihm vor dem Verhungern bewahrte und ihm vielleicht zu einem späteren Zeitpunkt die Chance zum Komponieren gab. Und wie so viele andere auch fand er, daß die Anstrengung, beide Ambitionen zu verwirklichen, ihn erheblich unter Druck setzte. Wäre ihm nicht 1845 ein glücklicher Zufall zu Hilfe gekommen, hätte er seine Tage vielleicht als unbekannter Musiklehrer beschlossen. Raff wurde am 22. Mai 1822 in Lachen bei Zürich geboren. Seine Eltern waren kurz zuvor aus Württemberg, wo der Vater, ein Organist, in die französische Armee eingezogen werden sollte, in die Schweiz geflohen. Die Mittel waren beschränkt, und so mußte Raff sich mit 18 Jahren seinen Lebensunterhalt als Musiklehrer verdienen. In seiner Freizeit komponierte er Klaviermusik, von der einige Stücke die Aufmerksamkeit Franz Liszts erregten. Liszt war so beeindruckt, daß er 1844 bei Breitkopf und Härtel in Leipzig die Veröffentlichung dieser Werke durchsetzte. I845 kam der Durchbruch, der den Grundstein zu Raffs späterem Ruhm legte. Liszt sollte in Basel auftreten, und um den großen Mann zu sehen, spielen zu hören und ihm persönlich zu danken, legte Raff den weiten Weg (80 km) zu Fuß zurück—auch für einen jungen Mann von 23 Jahren ein ziemlich entmutigendes Unterfangen! Doch wurde er ausgiebig belohnt, denn der einflußreiche Liszt mochte Raff auf Anhieb und verhalf ihm zu einer Anstellung in der Musikwelt, erst in Köln, später bei dem Hamburger Musikverleger Schuberth. Raff gewann Berufserfahrung und komponierte weiter für das Klavier. Doch war es zunächst nicht als Komponist, daß der nächste Fortschritt kam, sondern als Assistant Liszts, der ihn I850 nach Weimar rief und in sein Haus aufnahm. Raff blieb sechs Jahre, dankbar für die Erfahrungen, die er bei dem weltberühmten Virtuosen und Komponisten sammeln durfte, doch schließlich trieb ihn sein Ehrgeiz, eigene Musik zu schreiben, dazu, sich von Liszt zu lösen und sich in Wiesbaden als Lehrer und Komponist niederzulassen. Inzwischen war er auch verheiratet, und er kam seinen neuen Verpflichtungen nach, indem er eine Flut von Kompositionen anfertigte, die ihm endlich, abseits vom gütigen, aber überwältigen Schatten Liszts, eigenen Ruhm einbrachten. Raffs erste Oper König Alfred wurde I85I in Weimar uraufgeführt. Eine weitere Oper, Dame Kobold, folgte 1870; weitere Versuche in diesem dramatischen Genre gelangten nie zur Aufführung. Raffs zahlreiche Beiträge zum bereits riesigen Klavierrepertoire des 19. Jahrhunderts waren erfolgreicher, zielten sie doch größtenteils auf den einträglichen, populären 'Markt' der Salonmusik. Nur eines dieser Stücke wurde nach seinem Tod, mit dem schlagartig auch sein Ruhm verflog, weiterhin gehört, so daß er lange für den Komponisten eines alleinigen Werkes gehalten wurde. Raffs Kavatine galt viele Jahre lang wie auch Dukas' Zauberlehrling und Järnefelts Präludium als seine einzige Komposition. Heutzutage gelangt er wieder zu Ansehen, da Aufnahmen und gelegentlich ein Konzert oder Recital seine Kammermusik, Lieder, Chormusik, Violin-, Cello- oder Klavierkonzerte erneut ins Licht der Öffentlichkeit bringen. Im Mittelpunkt seines Schaffens stehen vier Shakespeare-Ouvertüren und elf Sinfonien, acht davon mit Untertiteln, die ihren literarischen oder programmatischen Inhalt widerspiegeln. Die Sinfonie Nr. I trägt den Titel 'An das Vaterland', Sinfonie Nr. 5 (der ein Gedicht von Gottfried August Bürger zugrunde liegt) heißt'Leonore', Sinfonie Nr. 7'In den Alpen' und die vier Sinfonien Nr. 8 bis Nr. I I beziehen sich auf die vier Jahreszeiten. Alle diese Werke trugen zu dem Ruhm bei, den Raff in seinen späteren Jahren genoß. Seine letzten fünf Lebensjahre verbrachte Raff als Direktor des Frankfurter Konservatoriums. Er starb 1882 im Alter von 60 Jahren. Die vorliegende Aufnahme bietet 2 Sinfonien aus Raffs mittlerer Schaffensperiode: Nr. 3 von 1869 und Nr. 4 von 1871. In den Jahren bei Liszt hatte er viel gelernt, vor allem das Instrumentieren. Er zeigte dabei eine äußerst geschickte Hand, was soweit ging, daß er sich bisweilen rühmte, Liszts Concerto Symphonique (d.h. das Klavierkonzert Nr. I) 'in Ordnung' gebracht zu haben. Liszt überließ ihm in vielen Fällen die Instrumentierung seiner sinfonischen Dichtungen, und so erscheint bis zum heutigen Tag der Name Raffs unter Liszts Tasso als Mitarbeiter. Raffs eigene Musik gibt jedoch eher seiner frühen Bewunderung für Mozart und Mendelssohn nach als der für die neudeutsche Schule Liszts und Wagners. Auch vor Beethoven verbeugt er sich: beide Sinfonien beginnen wie dessen 'Eroika' in einem dreiertaktigen Rhythmus in den unteren Stimmen des Orchesters. Raffs Sinfonie Nr. 3 steht in der gleichen Tonart (F-Dur) wie die 'Pastorale' und auch der Titel stützt sich auf Beethovens eigenen Zusatz'Mehr Ausdruck der Empfindung als Malerei'. Eine frische, offene Stimmung teilt sich in der lichten Instrumentation des ersten Satzes mit: hier zwitschern und flattern zweifellos Vögel zwischen den Zweigen des Waldes. Raff hält sich an die traditionelle Sonatenform, es genügt ihm, seine erfrischende Vorstellung von den Freuden des Waldes darzustellen, ohne zuzulassen, daß wir in unserer Konzentration von 'progressiven', formellen Elementen abgelenkt werden. Eine ähnliche Stimmung wird im dritten Satz, dem Largo evoziert, in dem das Nahen des Abends geschildert wird. In den Eckabschnitten sind die zärtlichen Duette von Klarinette und Horn beachtenswert, während die Dämmerszene geschickt durch die Streicher vermittelt wird. Es ist natürlich unausbleiblich, daß in Thema und Szene des Scherzos (Tanz der Dryaden) der Geist Mendelssohns zu spüren ist. Im Schlußsatz weichen die Dryaden vor der hereinbrechenden Nacht und den wilden Jägern, die vom Wald in einem stürmischen Marsch Besitz ergreifen, der Raffs bewunderswerte Kontrolle über die Instrumentation beweist. Ein magischer Übergang führt zur choralartigen Coda, und die Morgendämmerung durchflutet erneut den Wald. Diese Sinfonie trägt keine ausdrücklichen programmatischen Überschriften, doch ist es offensichtlich, daß der Komponist ein ernstes Thema im Sinn hatte, das bereits in den sich allmählich entfaltenden Einleitungstakten der Celli zutage tritt, die zunehmend an Ausdruckskraft und Festigkeit gewinnen. Der schwingende Impuls wird von der zweiten Tongruppe beibehalten, doch wird ihr ein gebrochener Stakkatorhythmus gegenübergestellt, der, wenn er im Holz vernommen wird, flüchtig an Elgar denken läßt. Hervorstechender ist jedoch in dieser zweiten Tongruppe die von Celli und dann von Oboe vorgetragene volksliedartige Melodie. In der kontrapunktischen Durchführung müssen die Violinen zeigen, was sie können; wiederum geht es um Ernstes. In der Reprise werden frühere Themen in ihrer ursprünglichen Reihenfolge wiederaufgenommen. Eine kräftige Coda bildet den Abschluß. Wiederum wird im Scherzo Mendelssohns federleichte Musik ins Gedächtnis gerufen, was aber in keiner Weise die Persönlichkeit Raffs schmälert, denn Mendelssohns Einfluß war in den Scherzi des ganzen 19. Jahrhunderts und in der gesamten europäischen Musik zu spüren. Dies ging so weit, daß vom Publikum erwartet wurde, daß das Scherzo eine schnelle Streicherfiguration und exquisite Notierung für die Holzblasinstrumente enthielt. Raffs eigene Persönlichkeit setzt sich durch und ist besonders einnehmend im Andante, dessen Soli für Fagott und Oboe ein erfindungsreiches lyrisches Talent beweisen, das nur von dem störenden Wesen des Kontrastmaterials herausgefordert wird. Doch ist eine geheimnisvolle Alchemie am Werk, zum Schuß ergänzen sich die beiden Elemente. Eine kurze Anspielung auf den ersten Satz leitet das Finale ein. Mit einem Wechsel nach G-Dur wird dann von den Holzbläsern das tanzende Thema dieses Satzes vorgestellt. Hilary Davan Wetton lenkt die Aufmerksamkeit auf die Violinen, von denen in dieser Sinfonie sehr viel abverlangt wird, besonders in diesem Satz, der sich durch mehrere Tonarten bewegt, bevor er in einer Reihe von atemberaubenden Unisoni der Streicher zur Tonika zurückfindet. Das Horn erinnert noch einmal kurz an den ersten Satz, wird dann schnellstens von der Coda expediert, die nicht warten kann, die Sinfonie in lebensbejahender Stimmumg zum Ausklang zu bringen.